Bonhams, a prestigious international auction house will send several appraisers to the San Jose Woman's Club, 75 S 11th St, on Thursday February 2nd from 10:30am-3:30pm to appraise several categories of fine and decorative art. 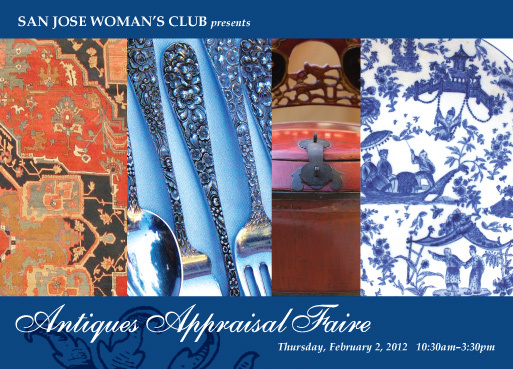 The public is invited and each item appraised costs $20 as a donation to the Club. To read more about the event and to buy advance tickets, please click here which takes you directly to our web site's Antiques Appraisal Faire window. There is no charge to wander in and see the action or view the Clubhouse. And the members have donated some wacky and beautiful things for sale to our guests. All proceeds benefit local charities and the Club's scholarship fund for SJSU students.